Secrets of Clay Animation Revealed 3 answers every question you ever had when it comes to stop motion puppet making, set building, animating, digital equipment and more. It is a book written with all the how-to methods the experts use to make clay animated films from start to finish. After reading Secrets you will know how to create several types of armatures, learn how puppets are sculpted, make a motion control rig, light your sets, make your own surface gages, use video reference and more. - Properly create ball and socket armature feet to add more mobility to your puppets. - Create several types of tie downs. - Prepare your armature for clay, and what accessories to use. - Properly create eyes for your character and how to get them to work smoothly. - Sculpt the body, face, and mouth of your puppets. - Save money when you have old dirty clay. - Use and make custom replacement parts. - Create a set properly for animation from building the set to texturing the different parts. Learn what materials are used and where to get them. - Create a sky, a glowing moon, and use rear screen projection. - Create water, fire, smoke, and clay painting effects. - Animator Anthony Scott of stopmotionanimation.com who answers many questions about how he likes to animate. - Kathi Zung who was one of lead puppet fabricators on MTVs Celebrity Deathmatch. She talks about all her puppet making tricks. - Animator Brad Schiff who works at Laika Studios in Portland Oregon and talks about his experiences and methods in the industry. - Justin Rasch, a rising stop motion film maker who recently won many awards for his short film Geralds Last Day. Justin talks about balancing his family with his films and more. - Armature maker Jeremy Spake tells how he got started and how he ended up making ball and socket armatures for Henry Selicks Coraline feature film. The E-Book has all full color pictures and is over 219 pages long. All pages are printer friendly so you can print what you like to take with you. 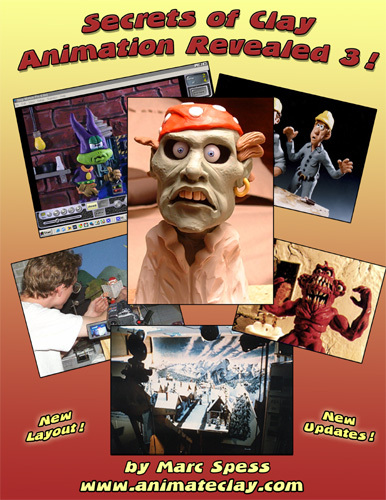 We are now giving away three free bonuses with Secrets of Clay Animation Revealed. First is our new 20 page e-book called Stop Motion Basics. This e-book is a summary of all the most common questions. From getting set up with digital equipment and software to using a surface gage. 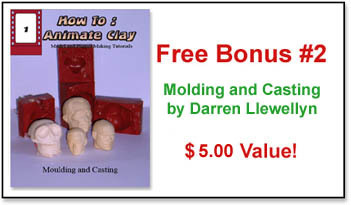 Our second bonus is the new Molding and Casting e-book by Darren Llewellyn. Darren takes you through each step for making silicone molds and casting plastic parts. The methods he uses are similar to the way they cast Jack Skellington's replacement heads. This is a must read! 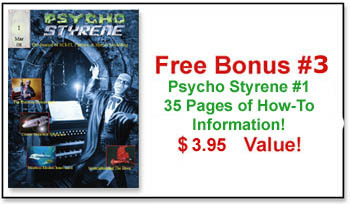 Our third free bonus is the first issue of Psycho Styrene Magazine. Again by Darren Llewellyn, you will get tons of how-to information about designing models, scratch building and painting them. Get all the free bonuses plus Secrets Revealed instantly after purchasing. The only requirement is that you have an unzip program like WinZip from http://www.winzip.com, or the free unzip utility at http://www.camunzip.com/.